Key Royale Club’s president has estimated that about $485,000 was embezzled from the private, member-only club in Holmes Beach. The amount was noted in the president’s letter to members in the club’s July newsletter, Tee Time Topics. To date, letters from the president and several statements from the Holmes Beach Police Department are the only publicly released details of the situation at the club, which operates the Island’s only golf course. Club officers and members have repeatedly declined to comment to The Islander. Word of an embezzlement first came in mid-May in a “Dear members” letter from club president Craig Humphreys. He said that there had been an embezzlement of club funds, there was an ongoing police investigation and that there were requested subpoenas of bank video. HBPD Chief Jay Romine has confirmed a “financial-based investigation” at the club led by Detective Mike Leonard. “We’re basically just looking into what happened up there. But we are not identifying a suspect right now,” Romine told The Islander previously. 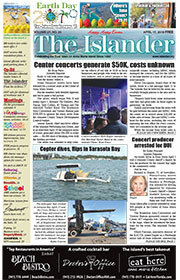 HBPD has not publicly identified a suspect or person of interest, and a review of online court records did not find a warrant on July 2, when the newsletter was delivered on the Island. The state attorney’s office was closed for the July 4 holiday. To represent the club at the courthouse in either criminal or civil matters, Humphreys said a legal firm was retained.